2016 has been a good year for staying connected. It has never been easier to get online in more places than ever - but the number of options and the tradeoffs between them remains as overwhelming as always. 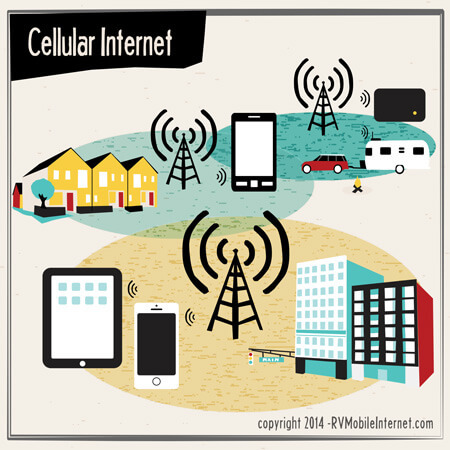 Things may be getting faster, data more bountiful, and connectivity better overall - but the world of RV Mobile Internet is certainly not getting any simpler. 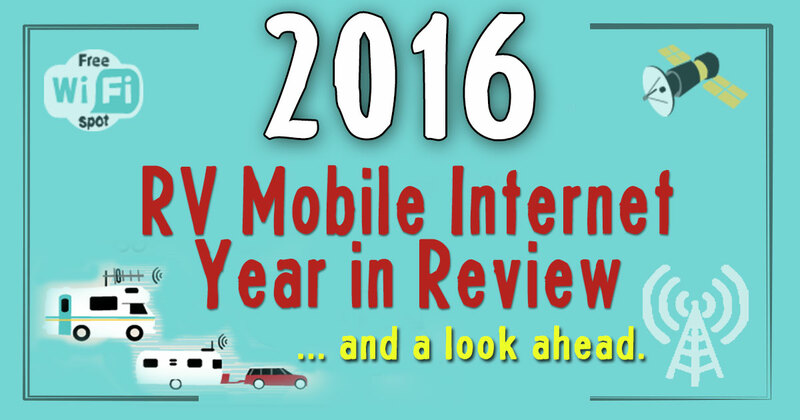 This is our annual end-of-year quick update on the state of the RV mobile internet world - chronicling some of the major changes that happened in 2016, and giving a glimpse at what we're most looking forward to in the year ahead. Below you will find recaps of the major development in Cellular, Wi-Fi & Routers, and Satellite Internet - the three primary internet options suitable for RVers. 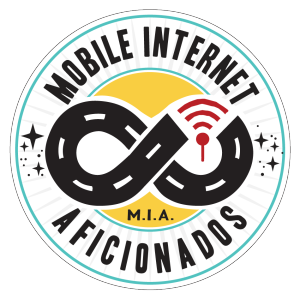 Don't miss any future news that impacts your ability to keep connected on the road! Join our premium membership service to support this site, and to get access to breaking news alerts, exclusive sneak previews of upcoming products, private member forums, interactive video chats, and lots more in-depth featured content! For most RVers, cellular remains the fastest and easiest way online - and things have only gotten better in 2016 as coverage has expanded and unlimited plans have made a surprising resurgence. But the fine print lurking below the surface means that most "unlimited" plans actually have plenty of limits lurking. The End of Overage Charges! Perhaps the most exciting news of 2016 has been the near elimination of overage charges by the major carriers. Following in the footsteps of T-Mobile and Sprint (and reacting to mountains of bad press generated by stories of thousand dollar overage bills!) - AT&T and Verizon have both rolled out new plans in 2016 that essentially eliminate overage charges. AT&T was the last major carrier to give up on overage charges, hopefully putting an end to the horror of surprise thousand dollar bills. Verizon's "New" Verizon Plan announced in July introduced a feature called "Safety Mode" that drops connections to 2G/128kbps speed when the high speed data allotment is used up - a much less painful alternative to $15/GB overage charges. But be aware - you do need to manually turn this feature on to be protected. If you do need more high-speed data, Verizon's new app will let you buy a 1GB "Boost" as needed, or buy a PopData pass for a period of 30 minute or 60 minutes of unlimited data. 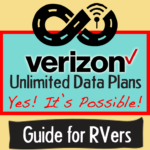 Verizon's Pre-Paid plans were also upgraded to include "Always-On Data" that is throttled to 2G speeds once the high-speed bucket runs dry. A month later in August AT&T became the last carrier to give up on overage charges, launching the new Mobile Share Advantage plans that instead of racking up charges drop to 128kbps speeds once the data allotment is used up. T-Mobile's "Binge On" announcement in November 2015 started a race to bring video streaming to cellular devices, and now every carrier has some officially sanctioned way to stream to your heart's content. But, almost always with a catch. Verizon - Verizon in February made it's Go90 video service free to stream without using up any data, raising substantial Network Neutrality concerns in the process. Verizon also announced that games viewed via the NFL Mobile app would be free to stream too. Watching other video services on Verizon however remains a costly proposition, unless you jump through the hoops to acquire a truly unlimited Verizon data plan or are willing to pay $3/hr to activate Verizon's new on-demand timed-but-unlimited PopData feature. AT&T - In January AT&T brought back unlimited smartphone plans as an option for customers who also subscribe to residential DirecTV satellite service, and then in September AT&T announced "Data Free TV" allowing all DirectTV residential customers to stream without limits on AT&T. 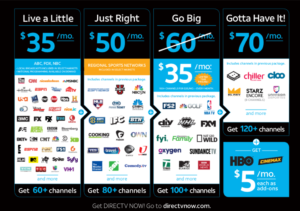 In November AT&T took things even further with the launch of the streaming-only DirecTV Now package - which allows AT&T postpaid customers to stream over 100+ live channels via the mobile smartphone app without using their data. AT&T has also announced a feature called "Stream Saver" coming in early 2017 that will optimize all video to low-res "DVD Quality" - but unlike T-Mobile's Binge On, all video other than DirecTV Now will still count against your monthly data caps. T-Mobile - T-Mobile's Binge On plan launched in late 2015 already allowed unlimited streaming at "DVD Resolution" of almost every major streaming site you could think of. T-Mobile took things even further with the T-Mobile One plan rollout, now allowing unlimited 480p streaming no matter what you choose to watch. If you want HD video, you can buy a 24hr "Day Pass" for $3, or pay $25/mo more per line for One+ service - which allows for unlimited high-speed (but deprioritized) tethering and unlimited day passes for HD video. And then in December, T-Mobile dropped the One+ add-on to $15/mo for those who do not need high-speed tethering. Sprint - In August Sprint launched the $60/mo "Unlimited Freedom" plan that allows for unlimited video streaming optimized to 480p DVD quality. 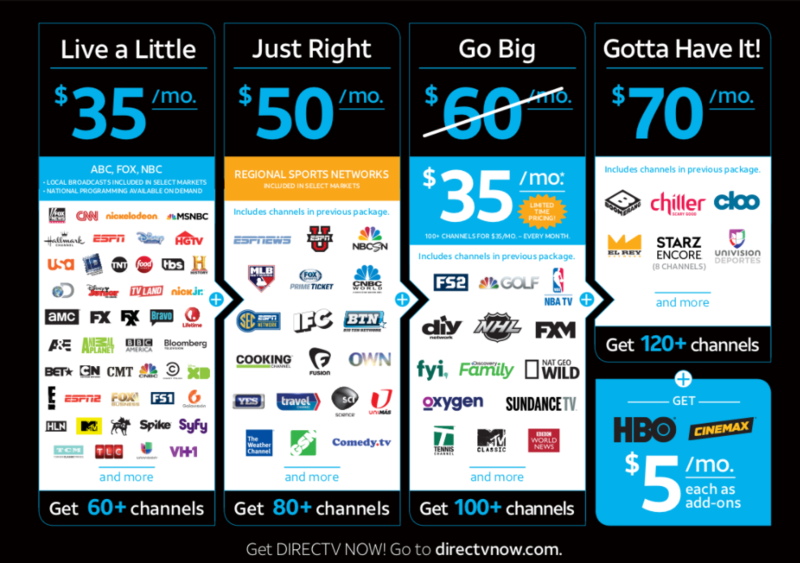 Or for an additional $20/mo per line you can upgrade to Unlimited Freedom Premium, with video at 1080p HD resolution. Unlike on T-Mobile One+, there is no need to manually activate Day Passes for HD video on Sprint. Netflix now supports downloading many shows in advance for watching later. Finally! Several video streaming services have become more mobile friendly as well in 2016 - with the Starz app launching in April with support for downloading shows when you have a fast free connection, allowing you to watch later while offline. Netflix in May rolled out cellular data usage controls, and then in December Netflix at last rolled out its own offline viewing mode as well. The carriers have all been actively rolling out new LTE technologies to increase speeds and coverage over the past year. In particular, every carrier is now using carrier aggregation technology in at least some areas to let mobile devices combine together multiple channels for increased speed. If you connect via older devices that are not LTE-Advanced compatible, it is time to start plotting an upgrade. Traditional MIMO lets your tech listen to two transmissions at once. 4x4 MIMO doubles that! Verizon - Verizon is comfortably in the LTE lead in the USA, but it has not been sitting still. 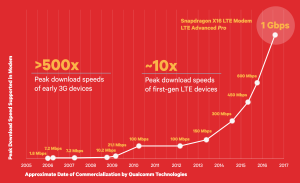 In August Verizon announced that it had heavily invested in rolling out LTE-Advanced technologies - reaching over 450 cities with 2x or even 3x carrier aggregation. AT&T - AT&T has seemingly been so focused on DirecTV and its media empire that its cellular network has been relatively ignored - with technologies such as LTE Band 30 that AT&T first launched in 2015 still barely deployed nationwide, and AT&T's LTE Band 29 is still seemingly only in trial deployments. T-Mobile - Though T-Mobile has not yet caught up with the raw coverage of AT&T and especially Verizon, T-Mobile continues to excel in raw speed and has been expanding its coverage map rapidly with "Extended Range LTE" allowing LTE Band-12 compatible devices to get online in more places than ever before, T-Mobile is even now boasting that it will have a coverage map that rivals Verizon by the end of 2017. If you use T-Mobile and have not yet upgraded to B12 compatibility, you are majorly missing out. In addition to the extended range technology, T-Mobile claims to be the first to deploy 4x4 MIMO and 256 QAM technologies for greatly enhanced LTE speeds with compatible devices. 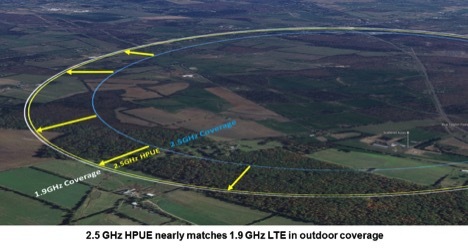 Sprint released this graphic illustrating how HPUE helps extend 2.5GHz LTE range. Sprint - Sprint reportedly has not had enough capital to invest much in expanding its network in 2016, but it has been working to make what it does have faster and more reliable - and we have definitely seen improvements when we are in solid Sprint areas. 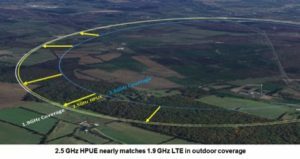 Heading into 2017, Sprint has announced "High Performance User Equipment" (HPUE) technology will be rolling out to enable better range and performance for future compatible devices. To help our members better understand all this techno-lingo surrounding LTE, we hosted an member exclusive 'Future of LTE' webinar, that is now archived in our Video Center. 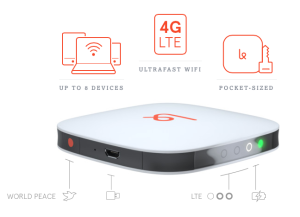 The small Karma Go hotspot lacked basics like a removable battery or antenna ports . But more concerning has been the lack of refunds for dissatisfied customers. Bad Karma - The once promising Sprint-powered Karma hotspot service had a horrible 2016. First in February Karma canceled its unlimited "Neverstop" plan just months after launching it. And things only got worse from there, with many former customers reporting ending 2016 STILL waiting for long promised refunds. Google's Project Fi Expands - Google's Project FI cellular service expanded in 2016 to use US Cellular towers in addition to Sprint and T-Mobile. Project Fi also expanded internationally - offering 10x faster speeds at no additional charge when roaming in over 135 countries. Non-Profits & Unlimited Sprint Data - Due to some old contractual encumbrances tied to the cellular spectrum Sprint uses, several non-profits have discovered that they have the right to resell effectively unlimited Sprint-powered hotspot plans. The Calyx Institute was the first to rise to prominence in September taking advantage of this loophole, offering a full year of unlimited data in return for a $400 donation. 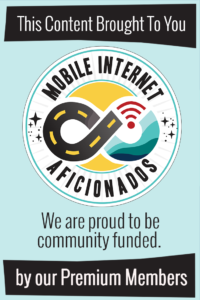 Shortly thereafter several other non-profits began offering similar plans - with the best offering currently from 4G Community that brings the effective cost of unlimited Sprint LTE data down to as little as $14/mo. We track all the options we know of here in the Review Center. AT&T's 2G Network Shuts Down - AT&T's 2G network reached the end of its life and was shut down on January 1st 2017. Our story on the shutdown includes the latest information on when Verizon, T-Mobile, and Sprint are planning to "sunset" their own legacy networks too. Verizon Cracks Down on Unlimited Data Plans - Verizon caused a panic in July by sending out letters to approximately 1,200 out-of-contract grandfathered unlimited data plan customers that Verizon considered to be "excessive" data users, canceling their accounts. At the same time, Verizon cracked down on several unlimited rental line vendors who were egregiously violating Verizon's terms of service. We covered this story closely - and provided our members in-depth guidance on how to keep their plans under contract and hopefully out of Verizon's crosshairs. Warning: Verizon is starting the year off by making another similar move to crack down on heavy UDP users. We've been sharing advance guidance with our members, and have published this report: Breaking News: Verizon Aggressively Moves to Cancel High Usage Unlimited Data Plans. This is only a handful of the stories we covered in 2016, so be sure to dive into the news center archives to read the other top stories for each of the major carriers: Verizon, AT&T, T-Mobile, and Sprint. 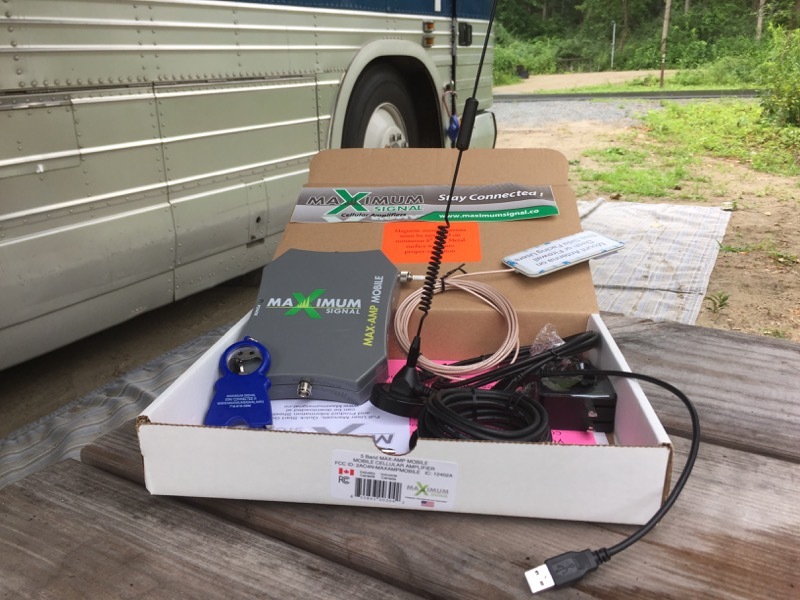 The Maximum Signal Max-Amp Mobile kit finally shipped last summer, more than a year after first being certified by the FCC. 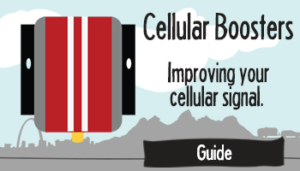 2016 was a slower year for cellular boosters than 2015, but there were a few announcements worth mentioning. Booster market leader weBoost came out with a new antenna option in June - a long awaited LTE-optimized "Trucker" style antenna that is also now also available bundled with the Drive 4G-X booster. While it did perform well in our testing this year, the 19"-24" form factor does present installation challenges in many RV applications. The long-delayed Maximum Signal Max-Amp RV finally started shipping in April after more than a year being "just a few weeks away" from release, and then the Max-Amp Mobile shipped in July optimized for smaller vehicles. The Max-Amp so far in our testing has failed to blow away the competition, even after they've replaced our unit multiple times. 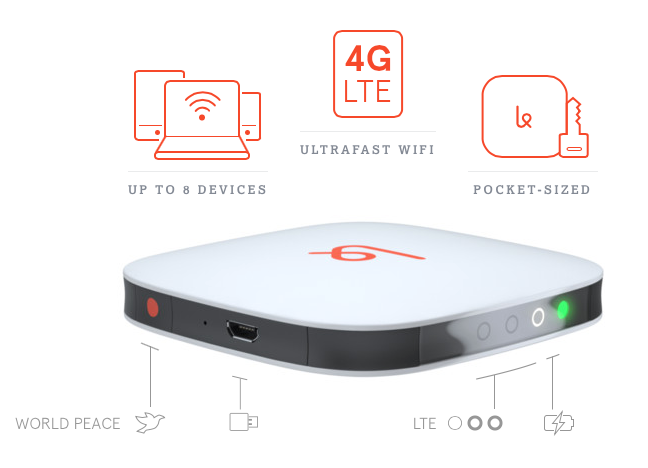 Wrapping up the year and pushing into 2017, two new cellular boosters have popped up on our radar - the Smoothtalker Mobile RV X6 and the HiBoost Travel 4G LTE. We have evaluation units inbound, and will continue our signal enhancing testing as we head into 2017. Here are some of the big developments we are closely tracking into the new year. FCC Chairman Tom Wheeler has pushed hard to pursue network neutrality rules, but he will be stepping down on January 20th, and the new FCC will have a vastly different agenda. The Federal Communications Commission (FCC) regulates the cellular carriers, and the current FCC has been the most hands-on in history - stepping in to enforce network neutrality rules and actively pursuing various consumer safeguards and investigations. Chairman Wheeler even personally intervened in 2014 to pressure Verizon away from plans to throttle grandfathered unlimited data plans. But everything related to the FCC is about to change. 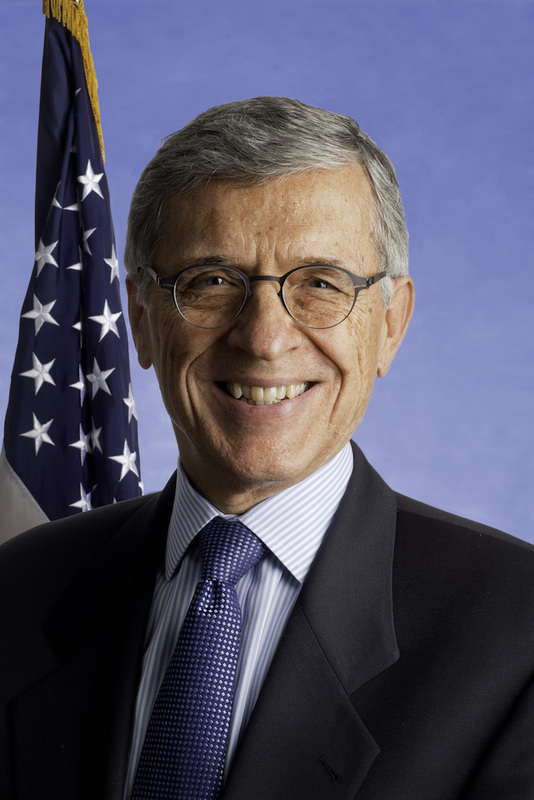 The incoming administration has yet to propose a new chairman, but it is certain that the new FCC will be charting a vastly different and much more industry-friendly course - reversing many of the current rules. The current network neutrality rules in particular are certain to be repealed, opening the door for carriers to cut deals to favor certain traffic from partners. The big carriers in particular will be free to continue pursuing sponsored data models (like Verizon's FreeBee Data) - which many fear could reduce the incentive for the carriers to further reduce the per GB fees to consumers. Network Neutrality is a very complicated issue - and there are solid arguments to be made on all sides. The important thing to know is that the FCC's enforcement stance will be changing, and the industry as a whole will need some time to adjust to the implications. Analysts also expect that the new FCC will also be more open to major mergers and acquisitions to consolidate the wireless industry, and less likely to be pursuing enforcement against carriers for misleading marketing or hidden limits on "unlimited" plans. We'll be tracking the incoming FCC closely to keep an eye on how all the upcoming changes in policy will end up impacting RVers and others who rely on cellular data connectivity. The 600MHz Auction - Fizzling Out? UHF channels are being bulldozed to make way for more LTE spectrum. A fiendishly complex "reverse auction" is currently underway that aims to facilitate clearing away over-the-air UHF TV channels 38-51 to make space for more low frequency LTE spectrum. It had been expected that many tens of billions of dollars would be spent on this auction by cellular carriers looking to expand their capacity and increase their coverage, and potentially entirely new players may take this opportunity to enter the cellular data market. But as 2016 comes to a close - the auction has been fizzling out, with bids coming in way lower than forecast. Analysts tracking the industry predict that this is in large part in anticipation of the new FCC (see above) being more open to carriers merging. Why spend billions buying up spectrum to expand when you can instead buy up a competitor? No matter how the auction ends in the months ahead, it will take time before the TV channels are shut down (or relocated), new LTE bands are defined, and compatible devices are released. T-Mobile hopes to be able to take the first steps towards using 600MHz spectrum by the end of 2017, but most other carriers think that timeline exceedingly optimistic. True fifth generation (5G) cellular technology remains several years away - but all the carriers are jockeying for position to be the first to demonstrate the latest experimental technologies working in trial deployments so that they can have more influence over establishing the eventual industry standards. In 2017, we expect to see many technology demonstrations and even some public pilot programs showing off the amazing speeds that future 5G radios will be capable. 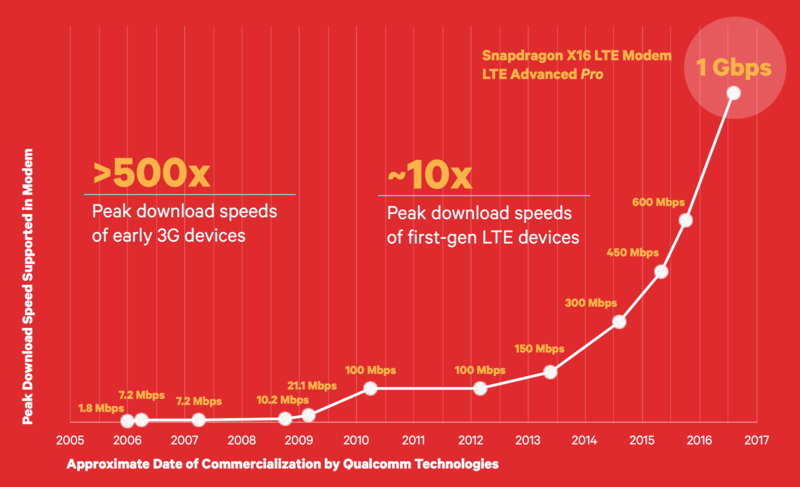 But current 4G LTE technology still has a lot of life left in it - and in the past week T-Mobile, Sprint, and AT&T have all boasted of intentions to be the first to push LTE towers towards peak theoretical speeds of 1Gbps before the end of 2017 using a combination of 4x4 MIMO, 256 QAM, and three-channel carrier aggregation. Speeds that fast over cellular are amazing to contemplate - and would have seemed unimaginable just a year ago! Further Reading: Yes, 5G Cellular Technology Is Coming! Comcast and Charter both have old contracts with Verizon that will allow them to take advantage of Verizon towers - allowing these new cellular services to launch on top of Verizon's already unrivaled coverage map. AT&T already owns DirecTV and is moving to buy Time Warner (parent company of CNN, TNT, HBO, and Warner Brothers) - which would turn AT&T into a media giant. AT&T seems intent to do everything possible to encourage AT&T customers to also subscribe to DirecTV - reserving some features like Canadian roaming and unlimited data options only for those who subscribe to both. Verizon is in the process of acquiring AOL and Yahoo - and is aiming to rival Google in being able to deliver targeted advertising based on deep customer tracking. Many expect that this is only the beginning of Verizon's corporate buying spree. And meanwhile cable TV giants Comcast and Charter have announced plans to get into the cellular market in 2017 - with expectations that they will launch services that roam between their vast networks of Wi-Fi hotspots and Verizon cell towers - with cellular service that will be offered bundled in with your cable bill. There are also continual rumors that Dish Network is preparing to jump into the cellular game too. The line between cable companies, satellite TV companies, media companies, and cellular companies seem destined to just keep getting blurrier in 2017. If competition heats up, it might bring about a price war that is good for consumers - particular if they are willing to buy into bundles of services. We'll have to wait and see how it all plays out in the end, but the year ahead certainly looks destined to be interesting! While long range Wi-Fi continues to lag compared to the rapid pace of innovation in the cellular world, some interesting progress has been made on the mobile router front in 2016. 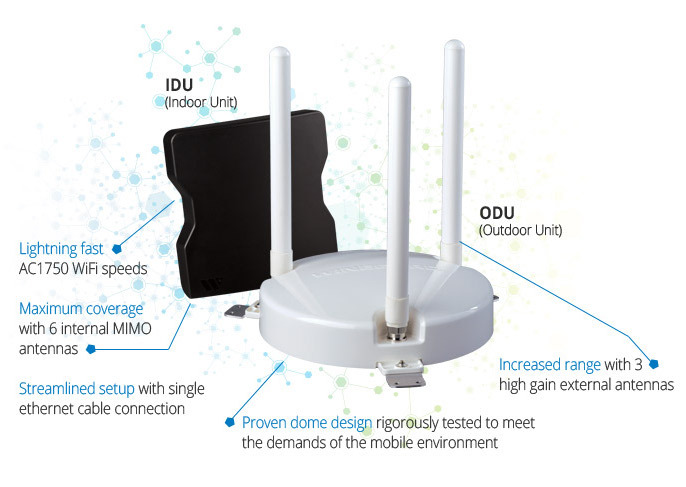 Most excitingly, 802.11ac Wi-Fi support has at last come to many mobile-friendly routers - opening the door to much faster local RV wireless networking. MoFi 4500 SIM4: In April MoFi released a major update to its line of cellular-integrated routers. The affordable MoFi 4500-SIM4 supports LTE-A cellular technology and is compatible with multiple cellular providers. On paper, it seemed like the ideal unit many RVers craved, but MoFi has struggled with software issues that have left many users frustrated. Cradlepoint Embraces LTE-A: Cradlepoint took the lead last year in upgrading its commercial-grade cellular-integrated routers to support LTE-Advanced cellular technologies, opening the door to faster and more flexible cellular connectivity. 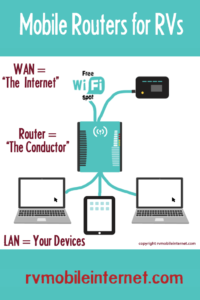 The Winegard ConnecT package consists of a small indoor router to provide a private indoor network inside your RV, and a long-range roof-mounted unit for connecting to nearby public Wi-Fi. Winegard Targets Wi-Fi Range Extension: Long known as a leader in RV TV antennas, Winegard in 2016 brought out the ConnecT - a roof-mounted long-range Wi-Fi system paired with an indoor 802.11ac router. Disappointingly, the ConnecT lacks any way to integrate with cellular data sources. WiFiRanger Embraces 802.11ac: RVer focused router & WiFi extending gear specialist WiFiRanger revamped its entire product line in November, releasing the new flagship indoor GoAC router as well as the companion roof-mounted EliteAC. Also new and and noteworthy is the indoor WiFiRanger Core, and the roof-mounted WiFiRanger SkyPro. Pepwave Launches Next Generation SOHO & MAX BR1 Mini: New in November was a major update to Pepwave's popular SOHO router, adding support for 5GHz 802.11ac Wi-Fi for faster local networking. Also new from Pepwave at the end of the year was the release of the MAX BR1 Mini, a basic cellular-integrated router costing just $299. We'll be starting our 2017 off by putting these options into extensive head-to-head testing to provide in-depth reviews for our members. We're looking forward to major updates to Pepwave's MAX line of cellular integrated routers, likely coming in the first few months of 2017. The updates should bring 802.11ac Wi-Fi and LTE-Advanced multi-carrier cellular to these popular higher-end consumer accessible mobile routers. WiFiRanger has just announced an upcoming initiative called "Passport" that should roll out in the next few months with the ambitious goal of making fast campground Wi-Fi a lot easier to find and take advantage of. 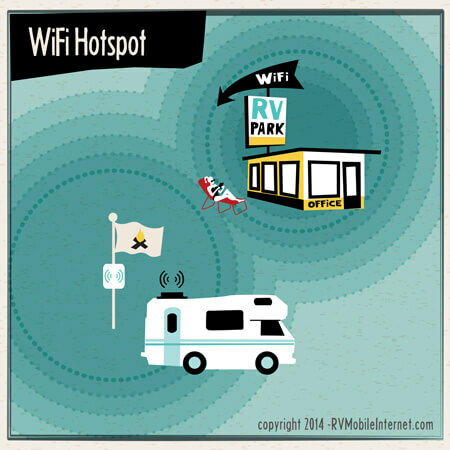 Campground Wi-Fi is notoriously disappointing - so any improvement here will be extremely welcome. After a relatively exciting 2015, 2016 has been a slow year in the RV satellite internet world as we wait for some major new initiatives to (literally) get off the ground. But the year ended with a launch - and there is more exciting news expected on the horizon! ViaSat Announces Plans to Build World’s Highest Capacity Satellite - Early in the year satellite broadband company ViaSat (the company behind consumer brands Exede and WildBlue) announced plans for its third generation satellite network - utilizing a next generation satellite planned to have more raw data capacity than ALL commercial satellites currently in orbit - combined! ViaSat-3 will not be launching until 2019 or 2020 however. SpaceX Reveals More Details About Global Satellite Broadband Plans - We've been tracking SpaceX's global mobile internet aspirations for over a year now, and SpaceX has at last revealed a few more details about its plans to be able to deliver gigabit broadband to all corners of the globe using an astonishing swarm of 4,426 satellites working together. At this point the project is still more "research" than "development" - and even if everything goes perfectly the earliest possible timeframe that consumer service might roll out is 2020. EchoStart 19 soared to orbit on December 18th. 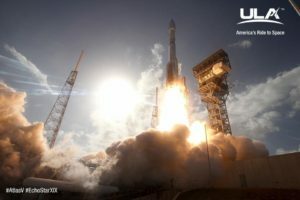 EchoStar 19 Launches from Cape Canaveral, A Huge Step for Mobile Satellite Internet - The year ended in a spectacular fashion with the long-awaited launch of the EchoStar 19 "Jupiter 2" satellite. Once it reaches its final orbit and is put into active service this spring, Jupiter 2 will at last allow HughesNet's fastest satellite service to have nationwide coverage. While HughesNet has not yet announced their details on mobile support or pricing, this potentially opens the door to a whole new generation of satellite service suitable for RVers. 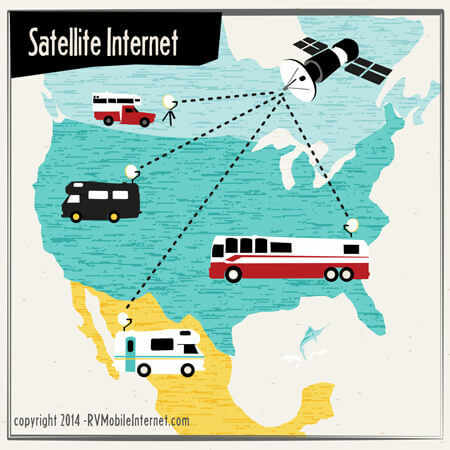 But even with new mobile-friendly options coming to market, satellite internet for RVers for the time being will remain primarily an option for those who have no other options. 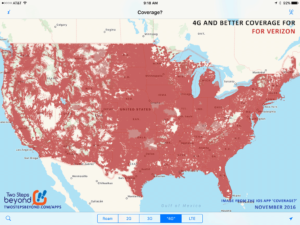 If there is decent cellular coverage where you need to get connected, odds are cellular will continue to be a better choice for the foreseeable future. 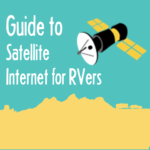 Satellite Internet Options for RVers - Newly updated featured guide on all the current and future satellite internet options of interest to RVers. The 66 satellites in the Iridium constellation are synchronized so that at least one will always be overhead. Things move slowly in the satellite internet world - but as we he head into 2017 the pace is picking up dramatically. Coming up any day now will be the first launch of the Iridium Next satellite constellation - with the first 10 satellites slated to launch on a SpaceX booster from Vandenberg on January 8th. The current Iridium constellation powers voice satellite phones that work around the world - but Iridium has only been able to provide extremely slow and exceedingly expensive data service using the current aging hardware. The new generation of Iridium satellites are designed with data services in mind, and once they are fully deployed in 2018 they will open the door to faster and cheaper truly global services than ever before. Also coming sometime in 2017 is the launch of ViaSat-2 - a new satellite that will substantially expand the available capacity powering the Exede service, potentially opening the door to Exede allowing for mobile customers. But the real revolution in satellite internet remains (as always) much further out on the horizon - with true next generation services from SpaceX, OneWeb, and ViaSat all making slow progress towards launches in 2019, 2020, or 2021. 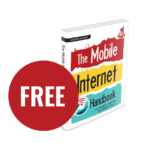 RV Mobile Internet Resource Center - 2017 & Beyond! 2016 has been a big year for us here as we've been able to shift our focus to making this website our primary professional focus, even bringing on staff to help out. 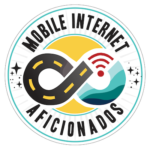 Mobile internet options are constantly changing, the traffic continues to grow, and our content has substantially expanded. 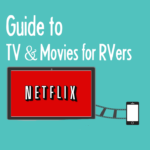 The big addition to the RV Mobile Internet Resource Center in 2016 has been the debut of our Product Information & Review Center, a new centralized resource for sharing all the detailed information on all the products in a range of categories that we are tracking - including dozens of our own in-depth hands-on reviews. 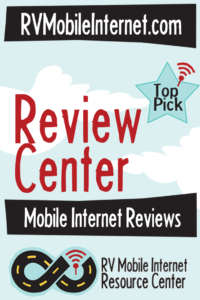 And best of all - our member's can submit reviews too, further expanding the community of Mobile Internet Aficionados. We've also been creating more and more video content - both free/public and member-only in-depth topical webinars and product tutorials. While much of that content is embedded in related guides throughout the site, we have also just rolled out an official Video Center, bringing all the videos into one place for easier access. 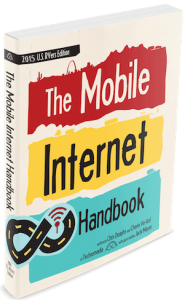 It seems like only yesterday that we released the 2016 edition of The Mobile Internet Handbook. And of course, since it's now 2017, that means it's time to contemplate the next edition. In 2016, we spent a lot of time re-writing the book to be more focused on the theory and less on the specific products that change constantly. We now keep that content updated here on the website. This means the current edition of the book is still highly relevant, especially when combined with this Year End recap. In retrospect, we should have just left it as the '4th Edition' and not put 2016 in the subtitle. Despite the dated title, we've decided that it just doesn't make sense to release a 2017 edition until at least mid-year. 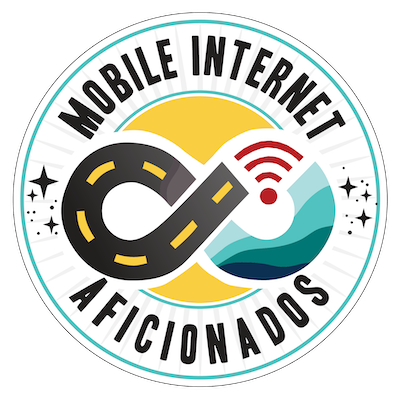 This allows us to focus more attention in the coming months on in-depth mobile router testing, continued signal enhancing testing, expanding our online content, and more. That means if you desire the content in the book within the next few months, you're good to continue with the current edition - and new edition is not on the immediate horizon. Our book sale page will be kept updated with our intentions for the next release. When we next rewrite the book, we will also be re-evaluating how the book and the website work better together - perhaps bringing out a shorter and more concise edition of the book. Or even having a version of it online that is kept updated throughout the year without having to go through a re-publishing. And of course, our premium members will continue to receive free updates to whatever we release. Beautifully laid out for all devices. Includes option for ePub format. Available from Amazon for Kindle or print on demand. Formatted just for Apple devices - iPhones, iPads and Macs. 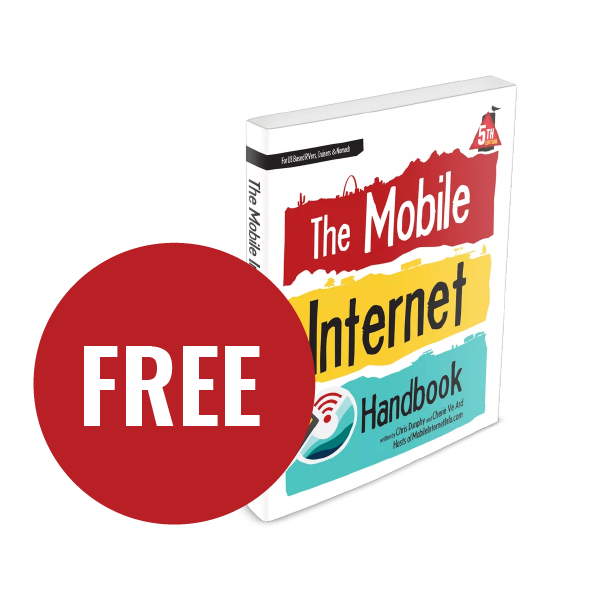 Mobile Internet Aficionados is our premium membership component of this resource center. Without member support, we would not be able to create the depth of free content we can offer to our RVing community via our news center, guides, and public discussion group. Our mission is to provide unbiased mobile internet information specifically for RVers by RVers. We research the options, share our personal & professional experience, and analyze industry news... so you can focus on what drives you. It is our honor to be able to bring this site to you, and a true joy to assist our members further.